Plagiarism is the act of taking someone else's work or ideas and passing them off as one's own. It is all about not telling people where you got your ideas from, particularly if you copy someone word for word. It is not necessarily about copyright violation although that could be part of it. William Branham told his audience in his sermon on the Seventy Weeks of Daniel (see below) that he “didn’t know it yet” (but was going to preach on it that morning), that he’d studied Larkin’s writings BUT DIDN’T AGREE WITH THEM and that what they were going to hear was going to come from a revelation that William Branham was trusting GOD to give him. This is how William Branham lifted himself up to become the “messenger of God” of our age. And this is why we feel it so important to compare what Larkin and others wrote side by side with what William Branham said. If Branham had preached on these subjects saying, “I’ve been reading these books, and I agree with what Clarence Larkin has written”, we would have no argument with him. But he didn’t. William Branham took direct quotes from Clarence Larkin (and others) and used them to deceive his audiences into thinking that he had a special rapport with God, and that God was using him to reveal things that no one had seen before. In fact, he told his followers that although he HAD read Larkin’s books (among others), “they didn’t come out right”, thus saying that he wasn’t going to preach what Larkin had written. He lied to his listeners, and that’s just not right. William Branham's plagiarism was first brought to our attention by Nathan Rivera in his ebook entitled "A Logical Refutation of Branham's Message" which is available for free download. What does God think about plagiarism? The Bible records what the Lord thinks of prophets who plagiarize from each other, and say it is a word from the Lord. KJV: Therefore, behold, I am against the prophets, saith the LORD, that steal my words every one from his neighbour. NET: So I, the LORD, affirm that I am opposed to those prophets who steal messages from one another that they claim are from me. GNT: I am against those prophets who take each other’s words and proclaim them as my message. NLT: “Therefore,” says the LORD, “I am against these prophets who steal messages from each other and claim they are from me. NIV: “Therefore,” declares the LORD, “I am against the prophets who steal from one another words supposedly from me. Paul quotes secular poets in the Bible. Is this plagiarism? It is clear that God is against plagiarism when a person says they received their inspiration from God, when in fact they received it from another person. If William Branham has simply said "I read this information in Clarence Larkin's book", then he would not have been guilty of plagiarism. But he didn't. Instead he said that he received it by divine revelation. He said that God gave it to him, which was a lie. He got the information directly from Clarence Larkin and others. Below are specific examples of plagiarism in William Branham's ministry. We have also addressed a few questions about plagiarism in the Bible which can be found by clicking here. Clarence Larkin (1850-1924) was American Baptist pastor, Bible teacher and author whose writings on Dispensationalism had a great impact on modern dispensational thinking. While William Branham only mentions Clarence Larkin twice in all his recorded sermons, he drew heavily from him but never gave Larkin the credit for these teachings. In these above quotes, William Branham says that he doesn't agree with Clarence Larkin or other commentaries. This gives the impression that the doctrine he preached was his own original ideas or lessons he received directly from the Angel (and not from anywhere else). But did he? Let's take a close look and compare what William Branham says to Clarence Larkin's books. His head and His hair was white like wool. Now, it does not mean that He was aged that did this. That wasn't the reason of it. He wasn't aged to do this. He was... It was because of His experience and qualification and His wisdom. Because He's eternal, and eternal cannot age. 1. HIS “HEAD AND HIS HAIR. His “Head” and “Hair” were “WHITE LIKE WOOL,” as “WHITE AS SNOW.” Here there is a correspondence to the “Snow White Wig” worn by English judges. This description of Christ reminds us of Daniel’s vision of the “ANCIENT OF DAYS,” “whose garment was white as snow, and the hair of his head like the PURE WOOL.” Dan. 7:9. Daniel refers three times to the “Ancient Of Days.” In Chap. 7:13, he distinguishes between the “Son of Man” and the “Ancient of Days,” but in verses 9 and 22 he associates the “Ancient of Days,” with a “Throne of Judgment,” and as God the Father has committed all judgment to the Son (John 5:22), and the Father and the Son are one, the title “Ancient Of Days” is used interchangeably. His hair, and His eyes once dimmed with human tears, yet I want you to notice something about those eyes. When He was on earth, yet they were dimmed with tears like a man, for He cried at the grave of Lazarus... But yet behind that humanity, He had something behind that could look right down into the heart of a man and know all about him. Brass also represents Divine judgment at the altar where the sacrifice was killed, brazen altar. Killed... The very foundations was brass, the judgment. He tread the winepress of the fierceness of God and took our judgment upon Him. Turn to Revelations 19:15, just a minute; let's see what He did. The voice of many waters coming forth from this One that looked like the Son of man, many waters. ...the great falls just below you, the great cataracts that'll take you to your eternal doom. Oh, what will that be on that day when that voice thunders out of many waters, many church ages forming out? ...Now, you drifting soul, you poor drifter that's drifting over that great cataract yonder, be careful. It'll be a horrible thing when you know that there's no saving for you then. You can't get saved then; you know your doom lays right before you. When you know within a few minutes you'll hear that voice speak out, "Depart from Me, you workers of iniquity, into everlasting fire which is prepared for the devil and his angels." You'll know when you hear that great falls a-roaring of those voices of those meetings, while you're passing out of this. Oh, what a horrible thing, what a nightmare. The seven stars are seven angels... (or seven messengers, seven ministers)... of the seven churches: and the seven candlesticks that thou sawest are the seven churches. The white horse rider of Revelations. Notice the sword. "Out of His mouth goes a sharp two-edged sword," the Word. And finally, by His Word, when It's made manifest to all the sons of God, He'll tramp every nation down with His Word, by this sharp sword. Look here what happened, as we get it. And... his right hand... and out of his mouth went a sharp two-edged sword: and his countenances was like the sun shining in its strength. "A sharp two-edged sword." What was going from the mouth of this Person? The Word of God. It's a sharp two-edged sword. “Out of His Mouth went a SHARP TWO-EDGED SWORD.” While the “Sword of the Spirit” is the “Word of God” (Eph. 6:17), and the “Word of God” is quick, and powerful, and sharper than any TWO-EDGED SWORD, piercing even to the dividing asunder of soul and spirit, and of the joints and marrow (the body), (Heb. 4:12), that is not the sword meant here. ...and his countenances was like the sun shining in its strength. If you turn to, let's see, Matthew 17. Let's just get it right here while we're at it; so we're just passing it through, and many of those people that are taking it, let's--or writing it down, we'll just let them read it so that we'll know. Matthew 17, all right. ...And was transfigured before them: and "His face did shine as the sun, and his raiment was white as the light. He was transformed. What did He do? Passed Hisself into transformation, over into His coming day. All right. "Sun shining in its strength," His countenances, transformed, transfigured. Now, another thing, in Revelations 21:23, if you want to put it down, in the New Jerusalem (21:23), He is the Lamb that's in the city that's the Light thereof shining; for they needed no light in the city; the sun shall not rise in it, because the Lamb which is in the midst of the city shall be the Light thereof. And the nations that's saved shall walk in the Light of the Lamb. ...the Sun of righteousness. Let's go to Malachi, Malachi, the last prophet of the Old Testament, Malachi the 4th chapter. NOTE: William Branham's book "An Exposition of the Seven Church Ages" (which is commonly referred to as the "Church Age Book" or the CAB) contains all of the plagiarism noted in his sermon series on the Seven Church Ages which were delivered in December, 1960. Most of the references in this article relating to the church ages are primarily to the actual sermons and not to the CAB. While the CAB contains all of the plagiarized text referred to here, some have said that the plagiarism in the CAB was the direct result of the involvement of Lee Vayle and, therefore, cannot be attributed to William Branham himself. The quotes contained below, however, clearly show that William Branham was the one that plagiarized Clarence Larkin's works. Now, the first church age started about A.D. 53, when Paul established the church in--in Ephesus... and the church age lapped over to 170. The character of the Church at Ephesus is a fair outline of the Church Period from A. D. 70 to A. D. 170. ...the very name "Ephesus" means "let go, relax, backslidden," called by God, "The backslidden church." Its character is seen in its very name, for Ephesus means to “let go,” “to relax.” It had become a Backslidden Church. ...then started in the Smyrna Church Age which lasted from A.D. 170 until A.D. 312. THE EPHESIAN CHURCH AGE 60-1205 ...the Smyrna Church...extended from A. D. 170 to Constantine A. D. 312. Then come in the Thyatira Church Age, and the church age of Thyatira begin at 606 and went to 1520, the dark ages. THE EPHESIAN CHURCH AGE 60-1205 The Message to the Church at Thyatira. This Period extended from A. D. 606 to the Reformation A. D. 1520. And then the Sardis Church Age begin at 1520 and lasted till 1750, the Lutheran age. THE EPHESIAN CHURCH AGE 60-1205 The “Sardis Period” extended from A. D. 1520 to about A. D. 1750. Then from 1750, the next age come in was the Philadelphian, Wesley age; that begin at 1750 and lasted till 1906. THE EPHESIAN CHURCH AGE 60-1205 The “Philadelphia Period” covers the time between A. D. 1750 and A. D. 1900. And at 1906 the Laodicean church age set in, and I don't know when it'll end, but I predict it'll be done by 1977. I predict, not the Lord told me, but I predict it according to a vision that was showed me some years ago... THE EPHESIAN CHURCH AGE 60-1205 The character of the Church today is Laodicean, and as the Laodicean Period is to continue until the Church of the “New-Born” is taken out, we cannot hope for any great change until the Lord comes back. Do you realize that the first three chapters of Revelation deals with the church in the church age? That's the tribulation period, not the church age; the church raptures and goes up at the 4th chapter of Revelation, never comes again till the 19th chapter when it comes with Jesus. That's right. That's in the tribulation period, not nothing to do with the church at all. John caught up in the 4th chapter to see things which was, which is, and which is to come. But the Church finishes at the 4th chapter, and Christ takes up the Church, caught up in the air to meet Him, and does not appear again until the 19th chapter when He comes back with--as King of king and Lord of lords with the Church. And at the same time the Church is gone, and these things don't even happen in the church age at all. That's right. They're--they're away from the church age. The Church absolutely is raptured at this time. The Church goes up in the 4th chapter of Revelation, and does not return until it comes back with its King in the 19th chapter. But these Seals here are revealing what has been, what is, and what will be. See? And now, what was to be for the church age was revealed by these Seals, and now, watch what takes it. The word “hereafter” permits a “time space,” while the words “after these things” refer to the things that shall immediately follow the completion of the “Church Age,” as prefigured in the Messages to the Seven Churches. The Church disappears from view with the close of the third chapter and is not heard of again until the nineteenth chapter, where her marriage to the Lamb is announced. Rev. 19:7–9. In his copyrighted 1919 book, “The Book of Revelation”, after Clarence Larkin wrote about Revelation chapter 5, he then took a bit of a sidestep to discuss the Seventieth Week in the Book of Daniel. Larkin later went on to write an entirely separate book titled “The Book of Daniel” (1929), which also spoke on his ideas regarding Daniel’s 70th week and its link to the book of Revelation. Coincidentally, that’s exactly what William Branham thought. And so, just a few weeks after he’d finished preaching on Revelation Chapter 5, he preached a series of three sermons on the 70th week of Daniel. If the Lord willing, this morning we're taking the subject of Daniel's Seventy of Weeks. ...The first three chapters of Revelation was the church ages. Then John was caught up in the 4th and 5th chapter and was showed things that—that was to be hereafter. Now, on the 6th chapter he drops down into the earth again to see things taking place that will go from the 6th chapter, the 1st verse, until the 19th chapter and the 21st verse. ...And it's something in the last time, a-many of the old-timers here, that I taught, I just said, "In here belongs the seventy weeks of Daniel," but I did not try to attack it to explain it. But this time, by the grace of God, I have taken upon myself to try to ask grace before God that I might bring it to the people. And in here I'm finding things that I do not know one thing about. And then I… I've been reading Dr. Larkin's book, Dr. Smith's book, Dr. Scofield's notes, different commentaries from men everywhere, and yet I cannot put theirs together to make it come out right. ...and having my trust solemnly in Jesus Christ to reveal it to me, because I do not want it to say, "I know this, and I know that." He knows my heart; He's listening at me. But I want it that I might enlighten His people. Therefore, I believe that He will give it to me. I do not know as yet, but I'm trusting Him for next Sunday, 'cause that'll be the tremendous part, as next Sunday to know and place those seventy of weeks. Each one has a different place. And when you do, you go to running them on through; they don't come out right; they don't register up right. It can't. And therefore, I—I may not be able to have it right, but I'm going to trust the Lord for it. William Branham must have read a lot of Clarence Larkin because he plagiarized him in a number of his key theological teachings. What are we saying? Who is this rider, this horse rider? You know what it is? It's Satan's superman... Notice, this rider is nothing but Satan's superman, a incarnate devil. This “White Horse Rider” will be Satan’s “SUPERMAN.” The Scriptures clearly teach that there is some day to arise a human being who shall be the embodiment of all Satanic power. Now, you must not misinterpret the Word. You say, "Well, I believe It means this." There are three things that we must avoid in the handling of God’s Word. 1. The Misinterpretation of Scripture. 2. The Misapplication of Scripture. 3. The Dislocation of Scripture. See, taste, feel, smell, and hear: the body, that's the open to the body. Now I want to take a text out of there, just one little five-lettered word: Token. Token! I want to speak on the word, or teach this Sunday school lesson, on the word of a "token." God must see this Token. He must see It in every one of us. He don't want to identify himself out there with that group; no, sir, this fanatics with the blood on the door. He don't want that identification. No matter how much priest he was, how much he knowed the Word, how well he had been raised, what works he had done, how much he had give to the poor, how much he had sacrificed! It's a perfect type of Christ, just exactly, the believer today standing under the shed Blood, identified with the Sacrifice. The blood was a “TOKEN.” “When I see the BLOOD, I will pass over you.” Ex. 12:13. It is not a question of “personal worthiness,” nor of “good works,” nor of “morality,” but of the BLOOD. “It is the BLOOD that maketh an atonement for the soul.” Lev. 17:11. The Israelites were not merely in a salvable state, they were SAVED, not partly but completely. If a hair of one of the “First Born” sheltered behind the blood had been touched, it would have proved Jehovah’s word void, and the blood of the lamb valueless. We may have no assurance as to our salvation, but have we applied the “Blood of Christ” to our soul, are we trusting to it, and it alone, for our salvation? If so, all that is necessary is, that GOD sees it. Clarence Larkin, Rightly Dividing the Word, 270 (Philadelphia, PA: Clarence Larkin, 1921). This is not meant to be an exhaustive list of all of William Branham's teachings that were "borrowed" from Clarence Larkin. However, it should be obvious to any one that is not under the thrall of cognitive dissonance that William Branham's major doctrines on the Book of Revelation and other important concepts originated in Clarence Larkin's books, and not because an angel revealed it to him. But was this really William Branham's "little story", or did he "borrow" it from someone else? So this farmer went; he got a eagle's egg. And he lacked one in having a setting, so he put the eagle's egg under the hen. And when that hatched out, it was the funniest looking little thing to all those little chickens. Why, he couldn't understand what they were chirping about; he spoke in a different language. He didn't know what them chickens was talking about. I hope you know what I mean. So then, he watched them, and he didn't know what to do. And they all picked on him, 'cause he said he was an odd fellow. He perhaps was. But he was an eagle to begin with. They could stretch their little wings and flop around, and he'd look at them. And they were, all the way they were. Old hen would cluck, and they knowed every one of the clucks, so here come the little chickens all running in. But the eagle didn't understand that cluck. And he wouldn't come in, because he didn't know that kind of clucking. I'm not going to say much, but I hope you know what I'm talking of. He didn't understand it. He talked different. But you know, one day she happened to be out in the barnyard feeding, and the old mother eagle happened to fly by. And as she flew by her great shadow swept over the top of the barnyard; she looked down, and she seen her own. He knows His own. And she screamed to him, and when she did, the little fellow turned his head and begin to look upward. That's the way he ought to have been looking all the time. And when he looked up, she screamed back, and she said, "Son, you're not a chicken; you're mine." The old mother said, "You're not a chicken; you don't belong there. You are mine." And he wondered what he could do; that's what he wanted. She said, "Just make the first big jump and flop your wings." And he made the first jump and flopped his wings; he found out he wasn't earth bound any more, 'cause he set on a barnyard post, right in a center of a Pentecostal organization. His mother said, "Son, you've got to come higher than that, or I can't get you." Said, "Just give another jump, and I'll bear you up on my wings." It is said that there was a man who had a poultry farm. And that he raised chickens for the market. And one day in one of his broods he discovered a strange looking bird that was very much unlike the other chickens on the yard. And after a while he outgrew that one day and then he had to build another cage. So one day when the eagle had gotten grown...and he began to get restless in the cage. Yes he did. He began to walk around and be uneasy. Why he heard noises in the air. A flock of eagles flew over and he heard their voices. And though he’d never been around eagles, there was something about that voice that he heard that moved down in him, and made him dissatisfied. ...He went there and opened the door. Yes. The eagle walked out, yes, spread his wings…and he flew up a little higher and went to the barnyard. And, yes, he set there for a while. He wiggled up a little higher and flew in yonder’s tree. Yes. And then he wiggled up a little higher and flew to yonder’s mountain. Yes. Yes! Yes. One of these days, one of these days. My soul is an eagle in the cage that the Lord has made for me. My soul, my soul, my soul is caged in, in this old body, yes it is, and one of these days the man who made the cage will open the door and let my soul go. Yes he will. You ought to be able to see me take the wings of my soul." Where did the inspiration for William Branham's sermon, "A Thinking Man's Filter", come from? Why is his retelling of Billy Graham's sermon on 2 occasions in 1960, almost identical to the basis for his sermon in 1965? Why did William Branham say he picked up a cigarette package when in another place he admits he didnt? So I turned around and went down by the river. And I thought, "I'll go down here and hide till they get done, so I can get out." And on the road down, I happened to draw... My attention was drawn to look over to my right side. And, as I did, there laid a empty cigarette package where one of them had throwed down, in all the running of the... when the squirrels were going through the bushes. And I picked up this certain cigarette pack, and was look... I never picked it up; I beg your pardon. I looked down at it. I didn't pick it up, 'cause I don't like the smell of the things, to begin with. And I looked down there, and it's a--a certain tobacco company that I guess I shouldn't call their name, but you'll know. 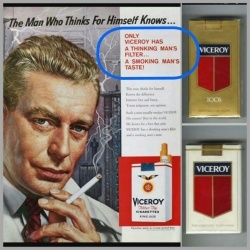 It said on there, "A thinking man's filter and a smoking man's taste." I looked at that thing, and I thought, "A thinking man's filter?" I thought, "If the man could think at all, he wouldn't smoke at all. How could it be 'a thinking man's filter'? A thinking man wouldn't smoke at all." All right. Notice how the story changes the next time he tells it. In the second telling, he does pick up the package and, rather than just happening to notice it on the ground, it is now the Holy Spirit that tells him to pick it up. Reminds me of a sermon I preached here not long ago, A Thinking Man's Filter. You might have had it. I was going, walking through the woods, I was squirrel hunting (this fall) and I looked down. And, of course, I can't call the cigarette company. You know it. And there laid a--a cigarette pack laying there. And I just passed by it, looking for... in the woods. And I seen that package laying there, and I looked back again, it said, "A thinking man's filter, a smoking man's taste." I just started walking on through the woods. And Holy Spirit said, "Turn and pick that up." I reached down and picked it up, "A thinking man's filter, a smoking man's taste." I thought "American firm here, selling death under disguisement, to their own American citizens." A thinking man's filter? You... And a smoking man's taste? It is interesting that William Branham talks about this twice in one week in December 1960, so it obviously impacted him. How many heard Billy Graham today? It was a wonderful sermon he preached on, how that a people could believe a lie and just keep on in that lie and--and even justify themself and think that they were doing what was right. The American public taking, he said, and--and saying, "A wise man's filter, and the smoking man's cigarette," taking a one of the devil's lies, and instead of making him a fool, whatever he is, to smoke such a thing and try to make him a wise man. He's a fool to even smoke it, when the--when it's full of death and cancer and everything else, and still he puts it down his lungs. He's a fool, not a--not a wise man's filter; there is no such a thing. A wise man don't use the stuff. "There's no life unless it's in Oertel's 92," or something like that. There's no Life outside of Christ; that's the real true Life. What makes men and women drink that stuff? Because they're trying to satisfy that thirst in there that God put in there to thirst after Him, and they're trying to satisfy it with the things of the world. And that's the reason we have those things. That's the reason people act like that, because they're trying to quench that thirst that's in them for God, and the devil's giving them death instead of Life. The doctors condemn it and says it's full of cancer. Then they get on the radio and say, "A thinking man's filter." "Thinking man's filter," a thinking man wouldn't smoke it at all. That's right. It take the second thought. But he tells the women it makes them real skinny, you know, so that you can wear some of these new kind of dresses they got. Boy, that sells it. More women smoke cigarettes than there is men now, and a woman will smoke three to one cigarettes to a man. That's exactly right, 'cause she wants to get thin. She don't realize that's TB and cancer and stuff making her that way, just in a baby form, coming into her, eating her up like that, killing her. Not a thing can come out of it but evil. That's right. See? But that--it--it's a thinking man's filter." Oh, my. William Branham made it clear in one story that he didn't pick up the cigarette package. Then in the next he says that the Holy Spirit told him to pick it up. Why did the story change? Is William Branham being truthful with the origins of his doctrines and stories, or is he doing exactly what is spoken about in Jeremiah 23:30? Do you remember years ago when I first, when we had the little bitty structure here, and I was prophesying, and said, "It shall come to pass in the last days, don't live in a valley and don't eat eggs." Details of this plagiarized "prophecy" can be found in our article entitled "Don't Eat Eggs". For details on the similarities with William Sowders, please go to the article on how William Branham appears to have copied doctrinal teachings from Sowders. We have had message believers state that there are several reasons why William Branham was not guilty of plagiarism. However, these claims do not hold up to any kind of scrutiny and simply appear to be symptomatic of Cognitive Dissonance. ...a derivative work is a work based upon one or more pre-existing works. Briefly, any other form in which an original work may be recast, transformed, or adapted can be considered a derivative work. A work consisting of editorial revisions, annotations, elaborations, or other modifications that, when taken as a whole, represent an original work of authorship, is also a "derivative work" (Source: Title 17 U.S.C. Section 101). In other words, using an existing idea to create or transform it into another idea. To put it bluntly, it means you can copy someone’s idea for the purpose of presenting a new idea. So basically, what William Branham did was a typical derivative work from Clarence Larkin. It is correct that U.S. copyright law protects the right to "make a derivative work," such as a movie from a book. But a derivative work does not include a direct copying of Larkin's work verbatim and including it in the Church Age book. We suggest that anyone concerned with this issue should review Larkin's work on the church ages and then read the first few chapters of Branham's church age book. Several pages of Larkin's work are copied almost verbatim. William Branham's plagiarism of Larkin's work is morally, ethically and biblically wrong. According to U.S. copyright laws, any works published before 1923 are already entered into public domain. It means it is given to the public. Anyone can freely use of the materials without asking permission or paying anything. Both of Larkin's 2 books being published before 1923, has already entered in public domain. By this alone, it is a proof that there is no plagiarism because the material was never stolen. There is no such thing as stealing in public domain materials. The problem with this argument is that it doesn't look at what the situation was during William Branham's lifetime. Larkin's The Book of Revelation was published in 1919 and passed into the public domain in 1975, 10 years after William Branham died. So William Branham was in clear violation of U.S. copyright law when he published the Church Age book in 1965. William Branham only mentioned Clarence Larkin 3 times in the recorded sermons. He is never mentioned in the Church Age Book. I've been reading Dr. Larkin's book, Dr. Smith's book, Dr. Scofield's notes, different commentaries from men everywhere, and yet I cannot put theirs together to make it come out right. And so, no doubt that down through the age there has been hundreds times hundreds of people, scholars, abled men, trying to explain what these seventy of weeks were. And I've read many of their commentaries on it. And I'm very grateful to Mr. Smith of the Adventist church for his views. I'm very grateful to Dr. Larkin of his views. I'm grateful to all these great scholars for their views on this. And in reading them, it enlightens me much that I can find places that looks right. But to get the views that I--I thought that I would like to explain, I searched through the encyclopedia of time to find out what time meant. So while William Branham mentions Larkin, he never mentions him in the context of the sermons that he preached that were based on Larkin's materials. Larkin is never mentioned in the church age series or the seven seals series. Larkin is also not mentioned in the Church Age book. That is what plagiarism is all about. Taking someone's work and not giving them due credit. He said he didn't really agree with Larkin when he actually stole a lot of his ideas. That is just wrong morally, ethically and biblically. ↑ Inc Merriam-Webster, Merriam-Webster’s Collegiate Dictionary. (Springfield, MA: Merriam-Webster, Inc., 2003). ↑ Clarence Larkin, Dispensational Truth, or “God’s Plan and Purpose in the Ages“, 128 (Philadelphia, PA: Clarence Larkin, 1918). ↑ Clarence Larkin, The Book of Revelation: A Study of the Last Prophetic Book of Holy Scripture, 20 (Philadelphia, PA: Rev. Clarence Larkin Estate, 1919). ↑ Clarence Larkin, Dispensational Truth, or “God’s Plan and Purpose in the Ages“, 129 (Philadelphia, PA: Clarence Larkin, 1918). ↑ Clarence Larkin, Dispensational Truth, or “God’s Plan and Purpose in the Ages“, 130 (Philadelphia, PA: Clarence Larkin, 1918). ↑ Clarence Larkin, Dispensational Truth, or “God’s Plan and Purpose in the Ages“, 131 (Philadelphia, PA: Clarence Larkin, 1918). ↑ larence Larkin, Dispensational Truth, or “God’s Plan and Purpose in the Ages“, 133 (Philadelphia, PA: Clarence Larkin, 1918). ↑ Clarence Larkin, The Book of Revelation: A Study of the Last Prophetic Book of Holy Scripture, 32 (Philadelphia, PA: Rev. Clarence Larkin Estate, 1919). ↑ Clarence Larkin, The Book of Revelation: A Study of the Last Prophetic Book of Holy Scripture, 53-54 (Philadelphia, PA: Rev. Clarence Larkin Estate, 1919). This page was last edited on 24 May 2018, at 22:47.